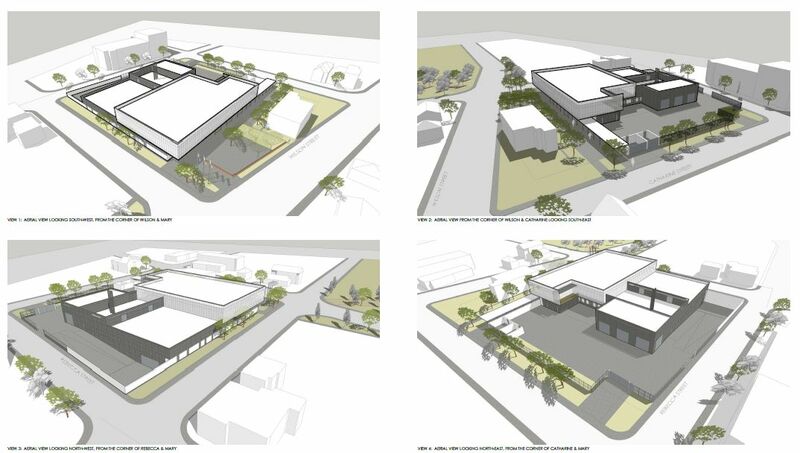 The proposed Hamilton Police Service forensics building is now at the formal application stage of the planning process with the City of Hamilton. Just prior to Christmas, the planning department’s Development Review Team reviewed the file. Staff comments and decisions are not made public. The project was not well received by the City’s Design Review Panel in July due to the conflict between the buildings secure nature – and uninviting design – and its location in the Downtown Core. It is important to understand that almost all spaces in the facility must be screened from view from the public spaces. For example, the office space is entirely dedicated to the ongoing investigations where the privacy of witnesses, victims , and suspects must be maintained. As such, most windows are either obscured or raised above normal viewing height. New renderings were not in the file. The project can now proceed to Council for final approval. The Police Board is hoping to get the project “shovel-ready” for any federal infrastructure grants expected in the next Federal budget.